Another quality product from Oakley, comfortable and clear large viewing space. I would recommend these as they are stylish and very clear. Good looking, very light sunglasses. The transition lenses, when darkened, are ligther than most others I've used. They are costly. Great product. Very nice when sweating profusely and humidity is high. They do not fog as advertised, and flipping the nose piece out helps the sweat miss the lenses. I was pretty happy with my Radarlocks, but I always had issues with the arms butting up against my Kask Protone helmet. That, along with the increased visibility at the top of the lenses were enough for me to try the Flight Jackets. I have to say, I'm quite happy with the subtle improvements. The fit, weight, and of course the Prizm lens are all on point. I haven't had any issue with fogging, so I haven't used that anti-fog lever... seems unnecessary thus far. I've used the Jawbreakers previously before and the prizm lenses are excellent which is one of the reasons why I wanted to get these as well. The advancer works really well which suits my needs since I am a heavy sweater. I would always have trouble sweating into my old sunglasses having to constantly wipe them, while with these I hardly would get any sweat on the lenses once I activate the advancer which pushes the entire lenses away from your face. These are light and very comfortable. 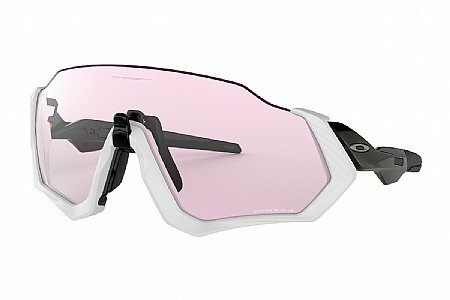 My first experience with Oakley Prism lenses occurred earlier this year with the purchase of new Oakley ski goggles. When I saw that the same lenses were available in cycling glasses, I didn't hesitate to order them when they went on sale. Great fit, field of vision, and wear. Highly recommended. Not as great as jawbone, however, the lense is essentially the same. The main complain is the fit. And I hate when the sweat drops on the lens (no issues with jawbreaker).